This one came to me from another shop. They wanted me to replace and program the PCM for a misfire problem. They’ve had this one to the dealer and still didn’t get the problem fixed. They replaced the ignition coil twice. They replaced all the spark plugs and wires. All 4 injectors and the MAP sensor. The customer has been driving it like this for 8 months. 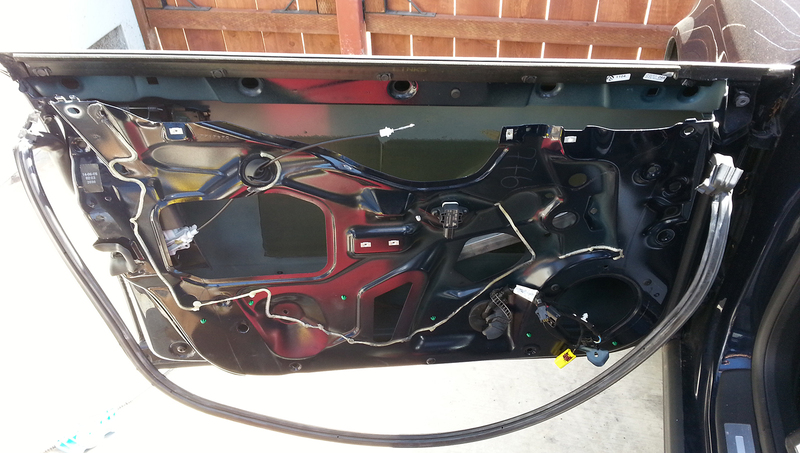 After performing the basic diagnostic inspection, I informed them a PCM replacement wouldn’t fix the problem. They let me run some advanced diagnostics with my Pico Scope. It only took about an hour to find the problem. Even the dealer couldn’t find and fix this one. Here’s a capture of the problem found with the Pico. The top image shows ignition coil amperage issue’s on the #2-3 coil. Look at the peak amperage for the 1-4 and 2-3 coils and you’ll see the fault. I found the wires crossed in a connector that was replaced. I don’t know who did the work, but after correcting the wiring problem the vehicle ran great and the MIL lamp never came back on. A PCM for this car costs $700.00 dollars plus programming. It’s not a returnable part. It would have been almost $1000.00 dollars wasted. Here’s a capture after the repair. This customer was extremely happy to have her car back and running better than ever. Bottom image shows the proper coil amperage after the repair was made. A simple wire repair was the only problem and this customer has spent over $2600.00 dollars trying to fix it with no results. The customer’s concern was hard starting. It would start but had an extended crank time. It would eventually start after the 3rd or 4th attempt. The symptom was more pronounced after sitting for extended periods of a few hours or more. 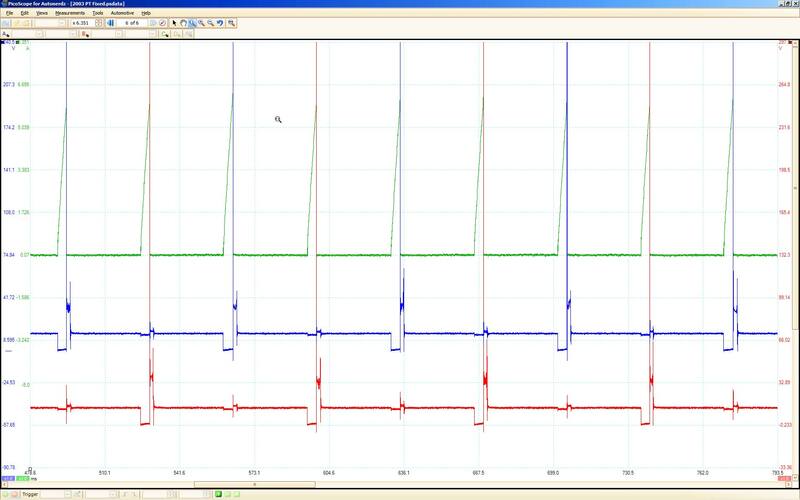 Here are some diagnostic Oscilloscope captures taken during the fuel system testing procedure. You can see how the fuel pressure is somewhat low with the engine running. The fuel pressure regulator functions okay and the pump’s RPM’s are within normal operating range for a 10 segment pump. The current (amperage) load is not within specs. Notice how the fuel pressure drops off to zero within 10 seconds after the engine is shut down. This is an abnormal pressure drop. This is the cause of the customer’s concern. A normal pressure drop should be less than 5 PSI after 15 minutes. The running fuel pressure should also be closer to 55 PSI. Cutting the old pump open for a visual inspection reveals the commutator bars looked okay. 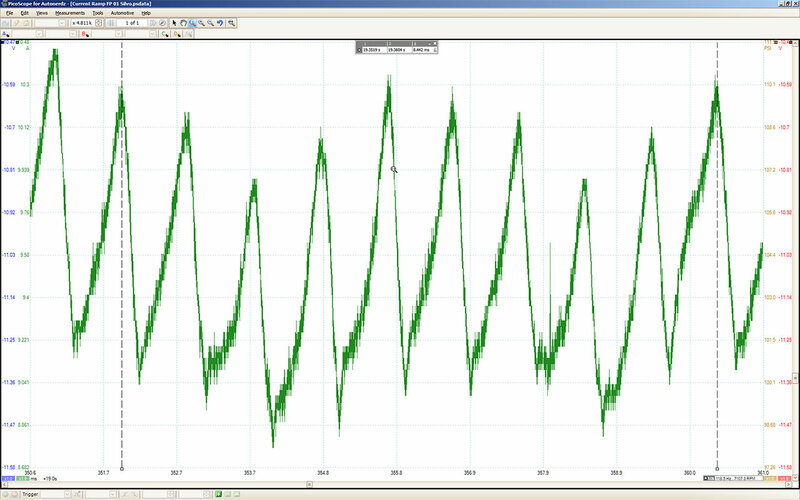 The pump’s internal fuel return check valve had failed allowing this abnormal pressure drop after pump shutdown. The initial pump prime of 2 seconds at key on couldn’t produce a high enough pressure to start the engine. After a 3rd or 4th key cycle the pump prime pressure increase was enough to start the engine. Always verify the cause of failure before replacing parts. Also verify proper operation after all parts replacements. The fuel filter was also replaced with the fuel pump to protect it from possible filter restriction damage. To ZOOM for a larger image, just click on them. This is the fuel pump’s armature with 10 commutator segments. This is the current ramp (amperage draw) and segment signature of the pump while it’s operating. 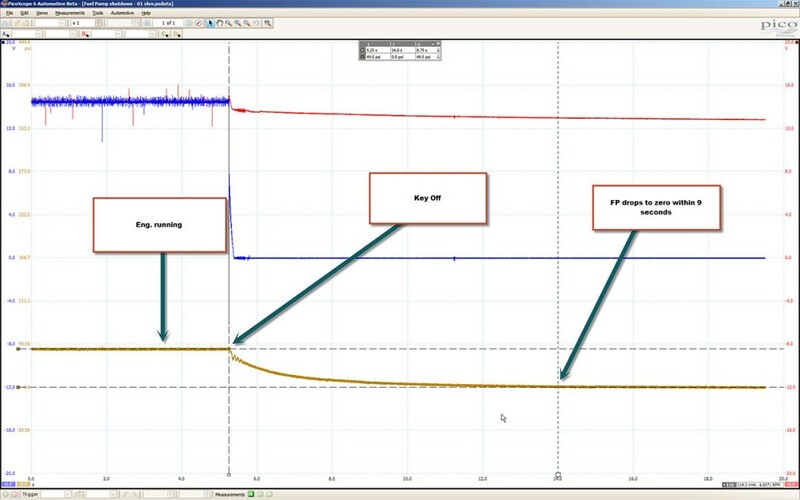 This capture shows fuel pressure from key on engine off, to start up and engine running along with a fuel pump input voltage monitored channel at the pump and the relay output channel at the fuse block. 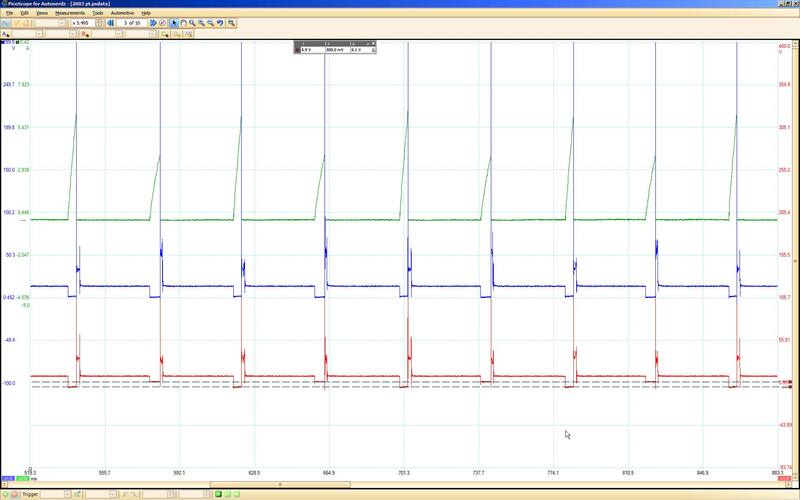 This also checks for possible voltage drops in the fuel pump feed circuit. 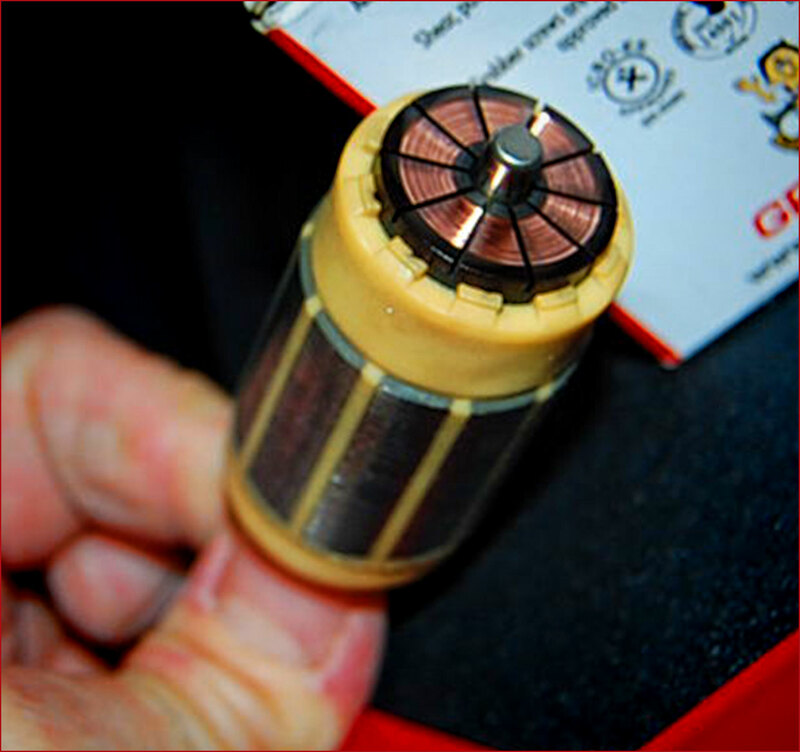 Voltage drops can cause low pump output problems that could lead to incorrectly diagnosed fuel pump replacement. 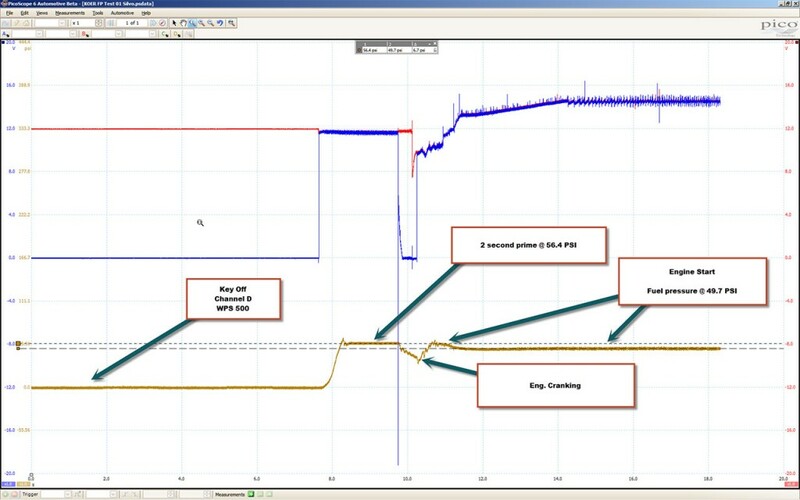 This capture shows the fuel pressure drop at shutdown. There is no substitute for a dynamic system test. This information is invaluable for proper fault verification to facilitate proper vehicle repair. No guesswork as to what’s wrong here.